Here is very cool animation of global commercial airline traffic over a 24-hour period. Watch the distinct patterns form and dissipate as the day/night terminator moves across the face of the Earth. Find out how to enter the IEEE-USA's online video scholarship competition for engineering undergraduates. Titled "How Engineers Make a World of Difference," this effort is designed to inspire junior high school students to prepare for an engineering career. Total of $5,000 in prizes available (it was $10k last year). Entries due by 16 January 2009. Here is last year's winner. The opening frame here displays, "In this film we shall study scientific principles involved in the operation of common home electrical appliances." See what the 1940s "modern home" looked like - it would be considered lower class today. Thankfully, gone are the bad old days of no safety grounds and no double insulated plastic cases (recall that plastic did not come into widespread use until the 1950s). Mysteriously, almost all the garage door openers in one neighborhood stopped working around Christmas Eve. The hard-wired wall switches work, and some remote controllers work when inside the garage, but not outside. People are blaming the nearby military base, but the Fed says no way. I suspect someone attempted a hijacking of the openers' codes. It is doubtful that a single RF interferer could affect so many systems without being obvious in other ways. Do you have a theory? Wireless energy transfer is getting a lot of press these days, with the ultimate goal being not just wireless but also battery-less devices. 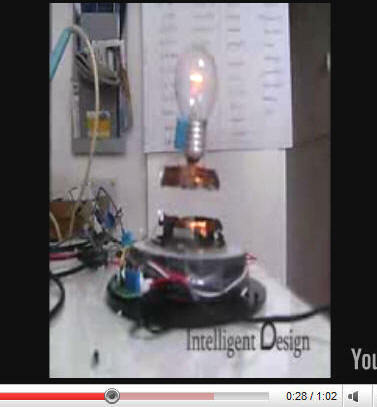 To illustrate the concept, Robin Massink, from the Netherlands, has built this magnetic levitation light bulb - very cool. Listen to what happens when this inexperienced German Coast Guard radio operator receives his first "mayday" call. The Navy recently set a new world record for the most powerful electromagnetic railgun ever fired. The gun fired an aluminum projectile at 10.68 megajoules, traveling at 2,500 meters per second (Mach 7). Eventually, the Navy wants to produce a 64 MJ version with a 200 nautical mile range that will fire 3,000 rounds per gun barrel. This will keep dangerous gunpowder loads off the ship. Taking another step closer to true humanoid robots, Canadian Trung Le, has introduced Aiko to the world. His extensive background in software and robotics led to developing Biometric Robot Artificial Intelligence Neural System (aka B.R.A.I.N.S.) software to control Aiko. She can read, recognize objects, respond to touch, and perform physical tasks. Some have dubbed Aiko "She-3PO." Animaris Currens Ventosa. That is a new "species" as dubbed by it progenitor, Theo Jansen. Theo's massive creations are amazingly sophisticated mechanical contraptions "created" to roam open beaches throughout their natural lives. His "bone yard" is full of "extinct" models that have succumbed to natural selection due to an imperfect creator. Here is the webcam inside his workshop. This 1959 video shows a precision approach radar system (FPN-16) that was part of the one I worked on in the USAF. It is shown sitting on a turntable at Craig AFB, Selma, AL. Here is a photo I took of the PAR display on one of our radar shop's MPN-14, ASR-PAR mobile radars, circa 1981. Hi Don! I've said it before, but I'll say it again: Japanese advances in humanoid robots has been absolutely amazing and unparalleled. This miniature "Murata Boy" incorporates multiple sensors for achieving balance, navigation, and obstacle avoidance skills. Its technology has applications in real-world vehicle stabilization and navigation roles, and for handicap assistance. The video is a bit slow moving (made at the Electronica 2008 show), but it is worth watching the entire show just to see what this little dude can do.